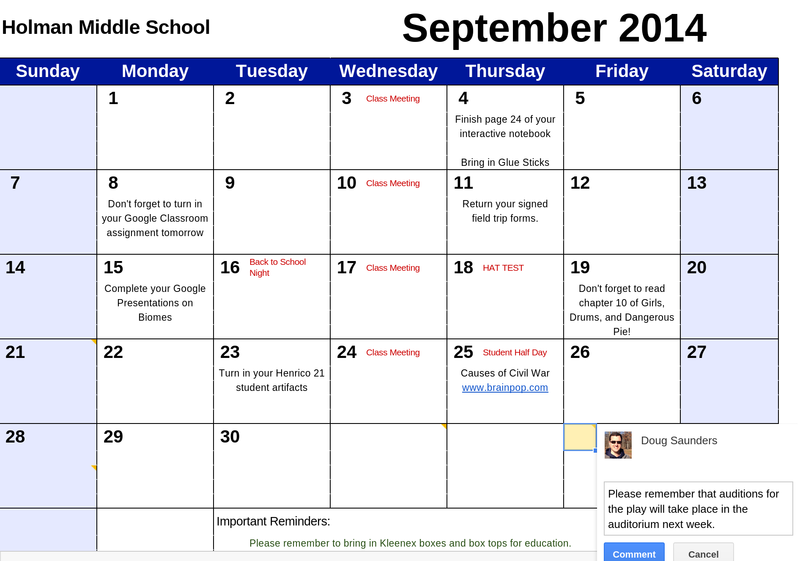 I have noticed that a number of HMS teachers are creating tables in Google Docs in order to display their homework boards in a calendar stylized format. This is a great way to keep a running record of homework assignments over the course of the school year. However, did you know that the Google Drive template gallery offers numerous calendar templates that you can download for free? A Google Drive calendar template can be published as a website and any updates you make to the calendar will show up in near real time on the published site. Another bonus would be the fact that you can share the document with comments enabled, hereby allowing students to leave comments or ask questions about a particular assignment or event. This template option may also appeal to those teachers who are uncomfortable with and/or unwilling to use a Google Calendar. You can view the online version of my sample calendar by clicking here and download the calendar template shown below by clicking here. To add the template to your Google Drive just click on File --> Make a Copy.